ACONSISTENT show aboard Pelann saw M7 Stables rider Sheikh Rashid Dalmook Al Maktoum ride in a comfortable winner in the Al Reef Cup at Emirates International Endurance Village in Al Wathba. The pair merely went through the motions in the FEI CEI** 120km Endurance Ride on Saturday to win with a time of 4 hours 22 minutes and 21 seconds. Trained by Mohammed Al Subosi, Pelann was ridden at an average speed of 27.44kph and was a pleasure to ride according to Sheikh Rashid, the pair climbing steadily during the four phases from 12th to fifth to third going into the final phase. In second place, a second behind was Argentine rider Martina Spelanzon aboard LM Strong, who is also trained by Al Subosi at M7. Abdulla Mohammed Hasan Al Hammadi of Al Reef Stables took third on the back of the Khaled Al Hamadi trained FS Mustafa with a time of 4:23.05. Amy Louise McAuley, who won last season’s CEN 100km Dubai Crown Prince Ride for Ladies and already a two-time winner this term with Seeh Al Salam Endurance Challenge and the more recent CEN 119km HH Sheikh Mohammed bin Rashid Al Maktoum Endurance Cup (Ladies) under her belt, found herself at the top of the standings after the first phase aboard F3 Stables owned Moondarra Maher. 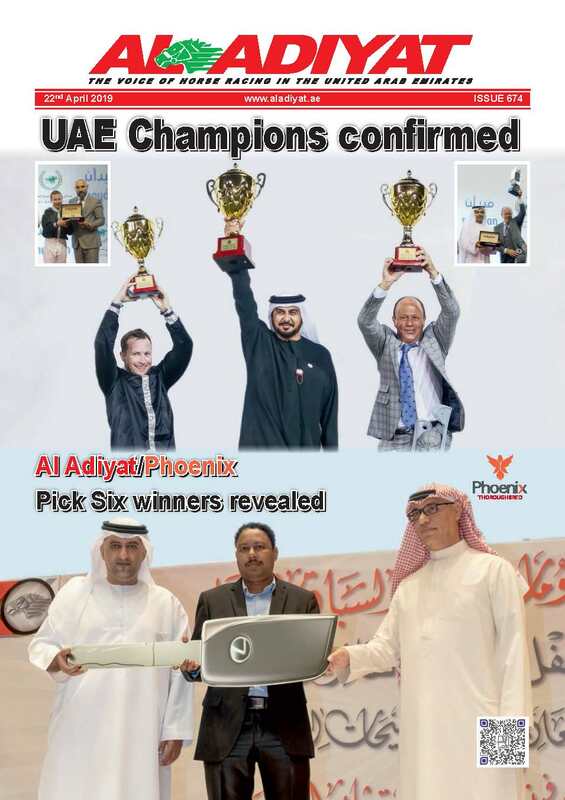 But the Irish rider’s elimination in the second phase after her horse was found to have an irregular gait opened the door for Sheikh Rashid’s M7 teammate Rashed Theyab Ghanim Al Marri to move into top place aboard Simbel Al Ain. A fate similar to McAuley’s befell Al Marri and after he was ousted on technical grounds, Sultan Adham Al Maazmi took up the lead aboard Emaar Endurance Stables’ Bogdan Du Chigny. 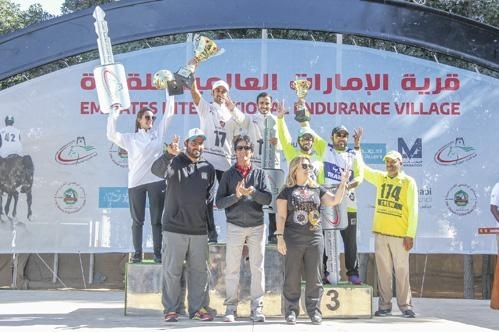 Sheikh Rashed was third at this stage 42 secs behind the leader with teammate Sheikh Hamed Dalmook Al Maktoum in second place atop Valdoh Du Kernic. Increasing his riding speed marginally proved sufficient for Sheikh Rashed to ride home the winner with Spelanzon only just behind. 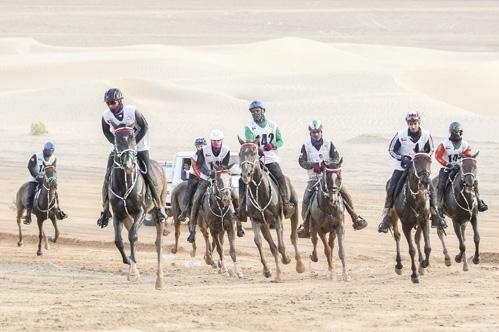 Three other rides were held during the course of the weekend at Bouthib as part of the HH President Cup series where Saif Juma Mohammed, Noura Abdulla Ahmed Mahmoud and Khadeejah Imani Sani finished as the winners. American Sani won the 100km Private Owners competition aboard Saeed Abdulla bin Huzaim-owned Eris KA with a time of 4:57.45, with second place going to Emirates’ Ahmed Saleh Mohammed AL Shehhi aboard Al Kamda Endurance Stables’ Tonki Dee Boo Summa, who clocked 4:58.46. In third place was Omani rider Said Saleh Al Balushi, who rode Abdulghani Abdulla’s Sole Dorado home in 5:02.27. 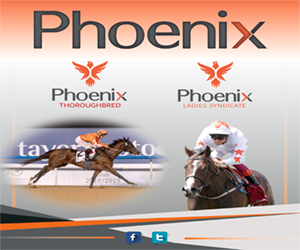 The 100km Ladies Cup was won by Noura Abdulla, who clocked the quickest time of 4:55.16 aboard Al Maghaweer Stables owned Dublin D’Iberica. Finishing second with a time of 4:56.25 was UAE’s Yalwah Mohammed Abdul Al Mutawa on Dubawi Stables’ Cameron, while third place went to another Emirati rider in Dubawi Stables’ colours. Fatma Jassem Al Marri filling that final podium spot aboard Kalharabi Rabah after clocking 5:02.02. Saif was the winner of the 120km CEI** Young and Junior Ride as he picked up the title aboard SS Stables’ Mekhlab with a time of 5:59.15. 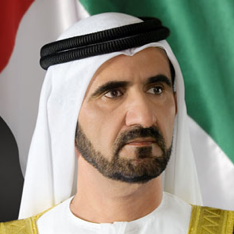 In second place a second adrift was Dubawi Stables pair of Mansoor Khamis Mohammed aboard Tamara Desert Moon, while third place went to Ahmed Fadhil Al Balushi of Oman, who clocked 6:08.42 aboard the HH Sheikh Rashid bin Hamdan Al Maktoum-owned LM Mauricio XR.